Tintern is now a thriving village community with a population of about 1,500. Industry has largely gone and there are few shops, though there are some craft workshops and IT businesses as well as tourist shops and cafes. 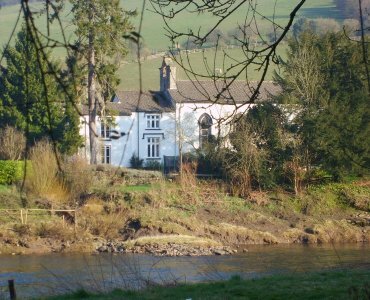 Nevertheless in view of its central position in an Area of Outstanding Beauty astride the Wye Valley Trail, and its great cultural and spiritual heritage, it is a magnet for visitors and has a reputation for warm hospitality generated by its variety of pubs, hotels and bed & breakfast accommodation. Above all it has a spiritual atmosphere which was captured in the following lines by one of its most famous visitors, William Wordsworth, in his poem Lines Written a Few Miles Above Tintern Abbey which sharply contrasts the image of Tintern written at about the same time in the Davies poem (see A birthplace of modern industry). The full title of this poem is Lines Composed a Few Miles above Tintern Abbey, on Revisiting the Banks of the Wye during a Tour. July 13, 1798. Much has been written about Tintern and the Wye Valley since Wordsworth penned these lines. Most recently some intriguing speculations about Tintern’s ‘hidden history’ have been published by the independent researcher Joy Hancox in her book The Hidden Chapter: An Investigation into the Custody of Lost Knowledge. She traces some fascinating connections between Tintern on the one side and on the other the new learning associated with the decline of magic and the beginnings of the scientific revolution, and she brings to light new evidence of Roman occupation, on the involvement British and French aristocracy, and of the influence of freemasonry in the area..
She also tells the story of The Nurtons, a fascinating house, now a B&B with a wonderful landscape garden, largely rebuilt in the nineteenth century, but with interesting remains of a much older building, was once a college founded in the reign of Queen Elizabeth the First by Sir William Herbert of St Julian’s, Earl of Pembroke. It is closely associated with the Renaissance philosopher John Dee and the philosopher Sir Francis Bacon, and she makes an interesting case that the latter may be buried in the ancient church of St Michael’s in Tintern where he is known to have had property including shares in the Tintern brassworks.